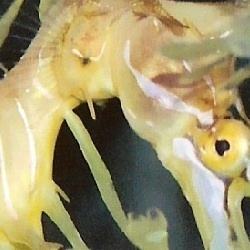 Yeah that's right you are looking at a seahorse. Yeah I know what you are thinking, "If this person has a picture of a seahorse. They are not someone I want to be messing with." Or you might be thinking "Man a seahorse this is some tree hugging granola eating tie-dye wearing hippie, and I like my chances." Balls in your court, or should I say seahorse is in your tank... Think about it.